There are several types of transportation you can use to travel between Stockholm, Sweden, and Oslo, Norway. Each transportation option has pros and cons. 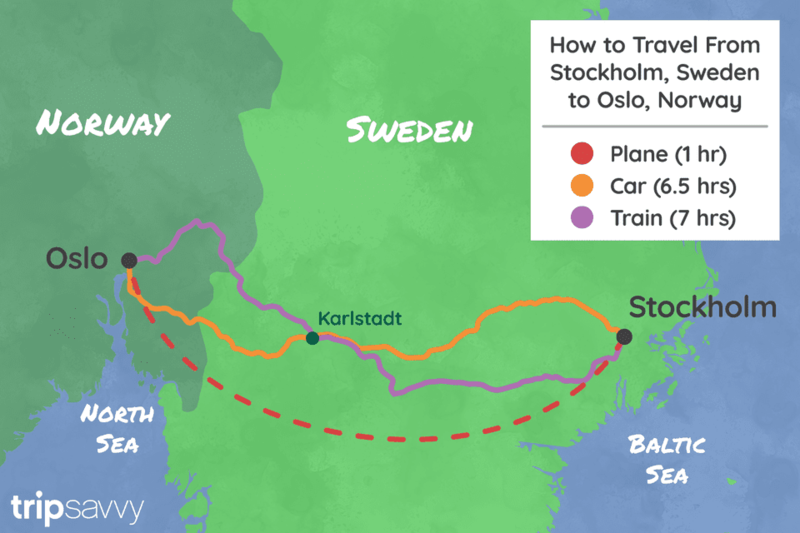 Here is a closer look to help you figure out which way of getting from Stockholm to Oslo fits you best, depending on your budget, your timeline and how much sightseeing you want to do. Some options are also better for families with children. You can get from Stockholm to Oslo with a quick, direct one-hour flight. These flights depart several times daily, most offered by SAS and Norwegian. Roundtrip airline tickets from Stockholm to Oslo (and from Oslo to Stockholm) are typically inexpensive, even cheaper at certain, slower times of the year. Air travel is a fast option, but it does involve getting to the airport, which can take more time and money. Taking the train from Stockholm to Oslo can cost less and you can reserve tickets online, but the trip takes longer. Expect travel times of five to seven hours between Stockholm and Oslo. You can book one-way or round-trip tickets on RailEurope or try the Eurail Scandinavia Pass for unlimited train travel between Sweden and Norway. The quickest (and priciest) train between Oslo and Stockholm is a high-speed train operating several times a day in each direction. Cheaper is Swedish Railways. Adults traveling with children on Swedish Railways can also take advantage of cheap children's rates. Those trains connect Stockholm with Oslo through a six- to a seven-hour trip. If you'd like to rent a car to get from Stockholm to Oslo, know that it's just more than 500 kilometers (310 miles) or a six-and-a-half-hour drive. Depending on your location in Stockholm, get to Oslo using road E18 or E20 (the distance is equal). If you use the E20 first, merge onto E18 at exit 121 toward Örebro/Oslo. Going from Oslo to Stockholm, simply use E18 all the way. Getting from Stockholm to Oslo (and back) by car is one of your slower options, not to mention the gas prices and the price to rent a car. There are buses connecting the cities of Stockholm and Oslo. Be warned: This isn't the ideal transportation option unless you have plenty of time to enjoy the scenery and don't want to pay much. Getting from Stockholm to Oslo by bus takes at least eight hours, although a single ticket is pretty inexpensive. You can purchase your bus ticket online, at Cityterminalen in Stockholm, in Swebus offices, by cell phone or on the bus (no cash accepted by bus drivers). The bus terminal in Oslo (Vaterland) is located next to the Central Railway Station. Swebus Express operates this bus connection (departing multiple times daily).